The element birín is rare in Irish names, but also occurs unqualified in Birreen, an outlier of Croaghmoyle. 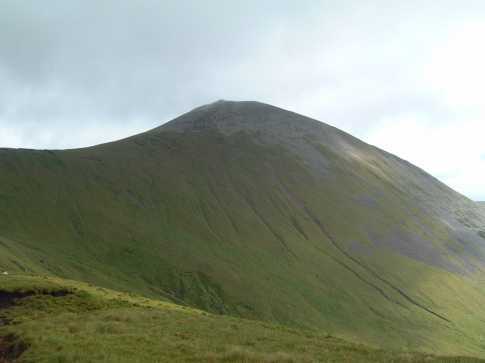 Walks: for a route to the summit from the N, see Whilde & Simms, New Irish Walk Guide - West and North, 70. Birreencorragh is the 118th highest place in Ireland. 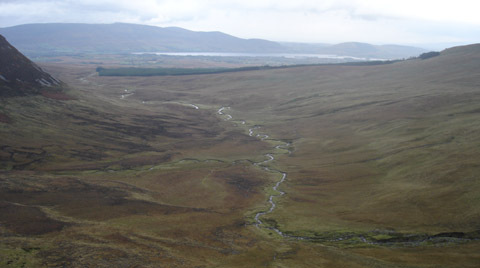 Birreencorragh is situated at the apex of the Glendorragha Valley off the R317 from Newport. The faces the mountain presents to the south and to the north west are particularly spectacular, while it slopes gently enough along a narrow ridge directly north and curls northeastwards towards Knockaffertagh to encircle the valley. The summit has the broken base of a trig pillar and a circular stone shelter. The best approaches are from the south beginning from the Coillte forest at the mouth of the valley. There are parking places here, at G042 027 A and G035 024 B, a good way along forest tracks from the road. 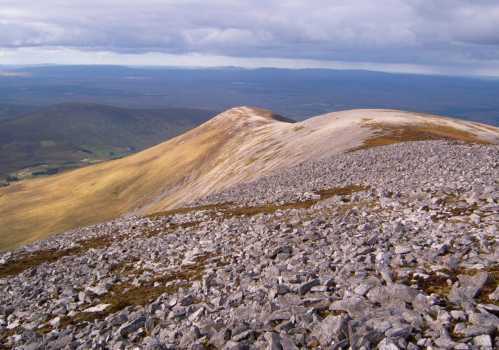 From the second of these spaces head north up a grassy rise towards sh336, west to Birreencorragh South Top and north to Birreencorragh itself. It should take under 1.5hours to the top.